Let me confess from the start that I am not a prepper. You know the type – they’re busy loading up on guns, ammunition, canned beans and bottled water, so they can retreat to a bug-out hideaway somewhere in the back woods. I’m not looking down at what they do, I just question the complexity and desirability of preparing for a multitude of disasters no one can accurately predict. But at the same time, I think going partially off the grid is something we should all think about. What do I mean by “going partially off the grid”? More than anything, reducing our dependence on the various systems in our lives. Generally speaking, most of what we need in life is provided by systems. They aren’t inherently bad. But they are subject to malfunction. And I think we can all agree that the various systems that both service and control our lives are becoming increasingly complex. And with that complexity, comes more stress, and a greater likelihood of system failure. Let’s consider different strategies we can use for going partially off the grid. This is not a call to quit your job and start a business. But it is a reality that in a lot of respects jobs are at the very heart of the grid. Conversely, a person who can run their own business, doesn’t need a job. 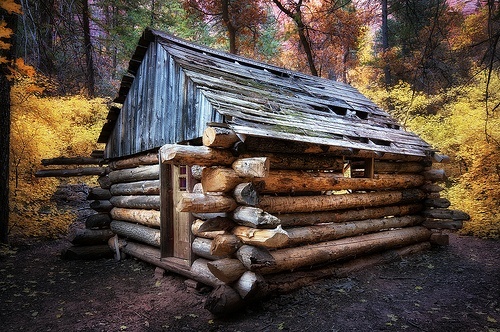 That’s not necessarily living off the grid, but it is escaping the employment grid. I mentioned how things are getting more complicated with the various systems that are dominating our lives. This is self-evident in the jobhunting process. To apply for a job in the 21st century, you have to apply online. There, you’re competing with hundreds of other applicants. Computer programs will sift through the applications and resumes, looking for certain keywords. If your application doesn’t include the desired number of keywords, it will be rejected. You won’t even get a response. Let’s add to that the plethora of rules and regulations surrounding most jobs. Political correctness dominates the workplace, and unequal distributions of workloads are quite common. But the reality is if you want a job, you must put up with these irritations, put on a happy face, and be a “team player”. In my experience, it’s gotten a lot harder to pull that off. You can go at least partially off the grid – the employment grid – by starting a side business. Not only will it offer you an opportunity to increase your income, but it will also make you less than 100% dependent on your job income alone. It also opens the prospect of eventually turning into your primary occupation. My freelance blog writing business started out as a side hustle. Now it’s my primary occupation. Choose a business venture, and carry it across the goal line. You’ll never regret it if you do. In Quiet Revolution – Young People Becoming Farmers, I mentioned in a comment exchange with reader Bev that growing your own food has a spiritual component. There’s something deep in planting seeds in the soil, and nurturing it all the way to your kitchen table. Not so long ago, most people did in fact grow their own food – at least some of it in a backyard garden. That’s not true today. The vast majority people are completely dependent upon the food chain system. Food often comes from thousands of miles away, and most could care less how it gets there. But the ability to produce at least some of your own food will at least partially relieve you of dependence on the food chain. If you could grow even 10% of the food you consume, you’d always know you could grow more. At least some of your food production would be off the grid. The financial cyber world has thus far proven to be remarkably efficient. But there have been data breaches, such as the recent Equifax databreach that compromised the identities of an estimated 143 million people. That was hardly the only data breach. It does point to certain systemic vulnerabilities, that may eventually disrupt the free flow of money across the web. It makes no sense to pull all of your money out of the bank or out of investments. But it’s never a bad idea to have at least some cash at home. I’ve heard 30 days living expenses recommended, and it makes abundant sense. If there is some sort of disruption to the financial system, you’d be able to hold out for at least a month. By then – hopefully – everything would be back under control. The basic idea is not to leave yourself completely exposed to some sort of systemic financial disruption. Our society has developed a formality about just about everything, and that includes networking. But for our purposes here, networking should be more informal. It’s mostly about maintaining a circle of friends, service providers and business associates who can help us in a time of need. At the same time, we should make our time and services available to reciprocate. One of the problems with networks today is that they’re often centered around a single capacity, like occupation. But if you’re an accountant, there’s only so much a group of accountants can do for you – and most of that is on the job front. An informal network – one that’s close to the ground – should include people of different backgrounds. For example, if you’re an accountant, you might want to network with some auto mechanics, home repair people, in-home care workers, writers, marketers, hairdressers, and computer professionals. That’s the kind of network that can enable you to find trusted sources of service providers. But since it involves people in various occupations, there’s probably an excellent chance that kind of group will provide a rich source of potential accounting clients. In fact, that kind of network functions more as a community than as a formal network. It’s about relying on people connections, rather than formal networks. This suggestion is of course primarily for homeowners. But renewable energy, particularly solar, is becoming increasingly affordable. Installation is still cost prohibitive at an average of $18,840. But there’s a federal energy credit that will reduce that by up to 30%. But once the system is installed, the energy flows free of charge. It’s a way to minimize your reliance on the electric grid. And as old as that grid is getting, that’s not a bad strategy. In recent years, banks have developed an unfortunate reputation for paying low rates on savings, charging high rates on loans, hitting you with a plethora of fees, and providing questionable customer service. You don’t have to put up with that. You can switch your basic banking over to a credit union. My wife and I have been using primarily credit unions for several years. To start, credit unions are owned by their customers, who are referred to as members. They provide free checking accounts, higher interest rates on savings, and lower loan rates. In addition, you’re more likely to have your loan application approved than you are at a bank. Credit unions function like neighborhood banks of old. It’s not like they’re off the grid, but rather less on the grid than banks. It’s a worthwhile transition. If you don’t know where to find a good credit union in your area, check out the government website, My Credit Union.gov. With the possible exception of being dependent on the job market for your primary income, there’s probably no more intractable system than lending and credit. Simply put, when you owe money, you’re beholden to the system and the institutions that provide it. Getting out of debt is one of the very best ways of going partially off the grid. Once you get off that treadmill, a lot of options open up. For starters, you gain full control of your income. For another, your life becomes more flexible. Is easier to change jobs, start a business, or make a geographic move when you’re debt free. We can even think of debt as being less of a grid, and more of a spider web. This is a good analogy because debt can feed on itself. You get one debt, and it’s followed by another, and still another. Each debt you take further reduces your cash flow, creating the need for additional credit. Perhaps more so than anything else, debt keeps you locked into the grid. If debt keeps you locked into the grid, having plenty of cash reserves frees you from it. Yet, technically speaking, the savings are primarily held within the grid. But at the same time, they reduce the stress and control imposed by other parts of the grid. Savings lower stress levels – your pile of bills just doesn’t seem as big. The larger the savings you have, the more options you have in virtually every area of life. Having a savings cushion that will cover several months will make it easier to quit a bad job. Having savings makes you less dependent on credit. Savings can turn emergencies into minor inconveniences, because you have the funds to deal with it. In fact, an emergency is only an emergency because you don’t have the money to cover it. People might associate having plenty of savings with being rich, but that’s not actually the case. In fact, having plenty of savings is even more important if you aren’t rich. After all, the rich are always able to tap resources to cover whatever situation might arise. It’s the poor person who can’t, and will feel most trapped within the grid. Having adequate savings enables you to feel at least some degree of insulation from the grid. Don’t worry if you haven’t been able to save money up to this point. It’s mostly a matter of getting started, and you just need a good strategy to do it. But once you get it rolling, it becomes second nature. And at that point, you’re less dependent on the grid. The healthcare system has become another integral part of the grid. Obviously, you’re more dependent on it if you have chronic health problems. That’s not always possible to avoid. After all, many chronic illnesses are genetic. And still others develop for reasons not known to medical science. The two strategies here are to 1) take care of your health to minimize the likelihood of chronic illness, and 2) work to minimize the impact if you already have one. This isn’t about self-medicating. But it is about being proactive. That includes eating a better diet, getting regular exercise and reducing as much stress as you possibly can. It also means avoiding bad habits, like excess alcohol consumption, cigarette smoking, and over-eating. One of the reasons why this is so important is because the healthcare system is already walking on wobbly knees. So far, the government has managed to keep it afloat with increased funding. But when it begins to dry up – and it will – the deep dysfunctions of the industry will become more apparent. Notice that with each of these categories, we’re not building a fortress in the woods and stocking it with survival paraphernalia. But we are reducing our dependence on the formal grid, whether that’s the job market, the banking system, the healthcare system, the food supply chain, or even the utility companies. One of the problems I’ve always had with the survivalist mindset is that it seems primed to survive in some sort of Mad Max world. That’s an apocalyptic scenario, and one most people would never survive. Call me simpleminded, but I don’t think that’s likely to happen. What’s far more likely – and what we really need to be prepared for – are lesser disruptions. Or even more precisely, the creeping influence the grid has on our lives. But by going partially off the grid, we minimize that potential, and give ourselves more options to resist. Whether we like it or not, the grid – however we define it – is an entrenched and necessary part of modern life. We can and should minimize our complete dependence on it, but that shouldn’t require going full on Neanderthal. Do you ever think about going off the grid? Do you see any advantage in going partially off the grid, and simply reducing your dependence? Hi Kevin. This isn’t necessarily a grid thing but is in line, sort of, with your renewable energy/utility section. We had a stand-by generator installed at our house about ten years ago. Living in a rural area, it’s not uncommon to lose power, sometimes for a few hours, others for a few days, depending on the problem/source. Storms can wreak havoc here, and as we’ve all just witnessed, in other parts of the country as well. Our generator comes on within seconds of a failure and can power most everything in our house with the exception of our dryer and maybe a blow dryer for my hair. Certainly, we’re conserving when on generator power, but we don’t lose heat, food in the frig, TV, etc. We are still dependent on our propane supply for the generator, but we are not inconvenienced in the least. It’s just another way to continue on with life without worry/stress or being dependent on a grid system. I’ve never regretted paying for that generator. I love that story Bev, because it’s similar to my sister and brother-in-law on their farm in New Jersey. When they moved in, one of the first upgrades was to get a high end propane generator. It was well worth the money. It’s served them several times in the past five years, most recently with the March Nor’easter. They were without power for a full two weeks, but the generator kept them going in the 21st century the entire time. I do think that’s an example of partially going off the grid because it’s about having a backup for when the grid fails. That’s the kind of thing we need to be thinking about. I have noticed that generators are fairly common in New England, even in the cities and towns. The heavy weather raises the prospect of losing power. I never even heard of back up generators when we lived in Georgia, though power outtages were hardly unknown. This is off the subject, but I really wonder what people in the South will do if the power ever goes out for a week or more during the height of Southern summers. It gets brutally hot during the day, and even nightfall offers little relief. No A/C, no fans – it won’t be pretty. It’ll probably be a lot worse than 2008 when the gasoline stopped flowing into the area. It looked like the day after a nuclear war – empty roads and stores. The loss of power will be many times worse, and probably lead to fatalities. What happened in 2008 with gas? Was that because of the recession or something else? I haven’t really spent any time in the south other than visiting some relatives, and that was off season at Thanksgiving. Why were stores closed? There was a main supply pipeline from the Gulf Coast that supplied most of Atlanta’s gasoline. There was some kind of break in the line, and gasoline was severely restricted for 2-3 months. Everything was fine for the first couple of weeks, but as the fuel supply began to dwindle, it got harder to get gas. After a few weeks the roads emptied out and the stores were thinly attended. We had to wait in line for what gas was available, and violence broke out. Gas stations were hiring off-duty cops to sit on the property just in case. It was a good example of what can happen when grids break down. For some reason it was confined to the Atlanta metro area, and a few surrounding cities, even though the big Northeast cities, that also rely on the same line, were completely unaffected. Thanks, Kevin. Didn’t recall that from the news. But, yes, good example of what happens when things break down. Great suggestions, all. Independence means more than “Financial” Independence. Some great ideas on where we can all reduce dependencies. Hi Fritz – Yeah, nothing drastic here, just gradually moving toward a more independent lifestyle. That can be more liberating than having more money. It’s Judy again, out in the woods in Washington State. The current post along with the one, “Sooner or Later we may all need to be Self Employed” are important ideas and very encouraging. As I told you when I rented here, I was told the apartment above a log house (fairly new construction) was wired for internet. There is no internet to most homes in this area of beautiful homes along with many wild animals. I cannot get internet. I was also told I had forced air heat but my apartment is not insulated. We just had a very cold and expensive winter. I tried to put together a look at the jewelry I craft but my hot spot internet affects my computer drivers updating. A vicious cycle. In staying optimistic I ordered your e-book on blog writing. I was encouraged until I got to the part on programmng language and working quite a time for free to become established. I’m always willing to count the cost, but I’m short on time to supplement Social Security income. I’ve been writing for years and published a few times. Once on a website that is no longer there. Just for fun I will send you a few pictures of jewelry I made from my phone. I know your wife will also want to see. Any ideas on the quickest way to start some income streams? Please keep hitting on your ideas from different angles. The world is changing at warp speed and independence will be our survival commodity. Hi Judy – Don’t get too hung up on programming language. That part was just an intro to basic HTML. It can help, but the quality of your writing is much more important. I included that section because no discussion of freelance blog writing would be complete without it. I wanted to show what’s possible when you add that to the mix. 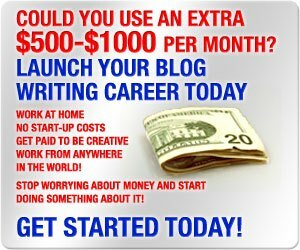 A lot of blog writers know absolutely nothing about it, and still make a living. I’m very interested to see the jewelry you’ve come up with. My wife is a jewelry fanatic. There are many people who profit from these Mad Max, doomsday theories. I’ve had looked at these sites and read some of these blogs. They are very well written and do a great job of selling you on their products. It’s their job to keep people in fear. More fear, more profit. It’s the same thing with these gold and silver websites. They spread all kinds of doomsday fears. If you read their blogs the sky is falling every other day. They make endless predictions on why this will go up and that will go up. They post graphs and charts and make very convincing arguments why you need their products. The government does this with the boogyman terrorist around every corner. Keep people in fear. That’s the best way to control everybody. These approaches that are written here are good. They use common sense. We can never plan for everything that could or might happen. Grow some of your own food. You can keep a stash of canned goods or food that has a long shelf life. Have a way to cook without needing gas or propane. ( I have a charcoal grill ) You can use a propane grill or cooking apparatus but it will run out. People don’t realize either that you can use the water in your hot water tanks. I have two tanks that are 35 gallons each. You can in an emergency use this water if you must. That’s really all we can do. If we ever got into a mad max scene I’ll admit I don’t really want to live. I have watched the walking dead and that’s all I ever wonder, why would you want to live in that. Why would you want to spend 6 months in an underground cave or bomb shelter? Hi Tim – You’re a man after my own heart! Like you, I’ve contemplated various doomsday scenarios to the n’th degree and concluded they’re not survivable in any way most of us would consider remotely acceptable. It would be the equivalent of being tethered to wires and tubes in a hospital bed in your dying days. You may survive a bit longer due to the preparations, but your life will be cut short, and it will be miserable until death comes. For example, think about the whole idea of needing to defend yourself with guns. If things get that bad, it’ll just be a question of time before you’d be killed. If that’s what the world is coming to, I’d rather be one of the early casualties. It’s one thing to contemplate a strategy to protect yourself in that kind of environment. But most people who do ignore the enormous stress they’d be under just living every day. Health problems (heart disease, infectious diseases, wounds, contamination, etc.) would be at least as likely to end your life as a gun fight. Not to mention trying to protect your survival inventory and losing. Then starvation enters the picture. Doomsday prepping is mostly a pessimist’s optimistic dream, at best. While it’s possible to see such a thing coming, it’s highly unlikely and not worth gearing up for. There are far more constructive uses of our time, energy and resources. I know a guy who’s pushing 50 whose preparing for – get this – a zombie apocalypse! That shows you the insanity level that’s overtaking the world. But I suppose if you’re prepping for doomsday, any scenario will do. But that’s another part of the problem – exactly what doomsday event will unfold, and how can you possibly be prepared for all of them. It’s a false sense of security even for those who are uber prepared. Of course being a Bible believing Christian, my view of the apocalypse is from the book of Revelation. But it has a dramatically different outcome – no one survives in the human sense. But people worry about physical survival at the expense of spiritual survival/connection. Speaking of the Walking Dead, I watched that series for a year, and went cold on it. The constant moving from one place to another, plus kill-or-be-killed seemed gratuitous and the opposite of what would be needed to survive. My thinking is the only workable strategy would be for hundreds of humans to ban together in a well-developed community, fend off the zombies, and create a self-contained economy and culture where they can repopulate and eventually overcome the zombie armies. But once again, that’s my literalist interpretation that makes watching these shows a struggle. One more point – an absurd one – you mention a propane grill for cooking…a lot of people today would have to rediscover cooking, because fewer people do it now than ever. We build designer kitchens for people who mostly eat out. You gotta love the world we’ve become! What is amazing is a 50-year-old man preparing for this. You have to figure over half your life is over anyway. I know this is a dumb topic but figure this. Let’s say he spends the next five years preparing for this. Then let’s say it happens in 10 years. He’ll be 60. Let’s say he has to live underground for a couple of years or hiding. That puts him in his 60’s. Does he really think he will have the strength to fight off zombies, try to feed himself and fight other human beings on top of that? He won’t have half the strength of a 25-year-old. It’s just not a common sense approach. I’m with you. I don’t want to live if that’s the world we are headed for. I’ll spend my time and money doing something now. Like I said, there is a huge profit to be made from fear. All the approaches mentioned above are temporary. They can last you a couple of weeks or a month or so but you would have to spend a huge amount of time and money preparing yourself to live 5 years or longer like this. The common sense factor is just gone now with so many. It is sad. Those are all factors I’ve contemplated too, but when a person becomes that extreme there’s no logic to the thinking. The people over 50, and especially those over 60 will be the last to survive. 20-somethings and 30-somethings would have the best chance, with the best combination of experience and youth. But as I say, it doesn’t have to make sense to the zealot who’s vested in the idea. It’s more of a religion than anything else, a crutch in a world gone mad – the illusion that they can maintain control when the world is falling apart. I can’t participate in it. Hi Walter – I’ve seen what your dad taught you again and again. People with simple wants always seem happier and enjoy greater independence. They may not have all the gold plated stuff that others do, but then they don’t have it all weighing them down either. I also think there’s great emotional and mental stress attached to wants. Even if you’re prosperous, you can lose sight of what you have in the chase to keep and acquire all of your wants. I’ve seen people with a lot of stuff spend inordinate time and mental energy fretting over losing what they have, or not getting what someone else has. I somehow think all that thinking would go away if people sat and seriously contemplated how short life is, and accepted the reality that it will end one day. All the possessions in the world won’t save us when that day comes. In that light, simple living becomes genius.